Guide to Plitvice Lakes National Park - Explore Croatia Become a Patron! 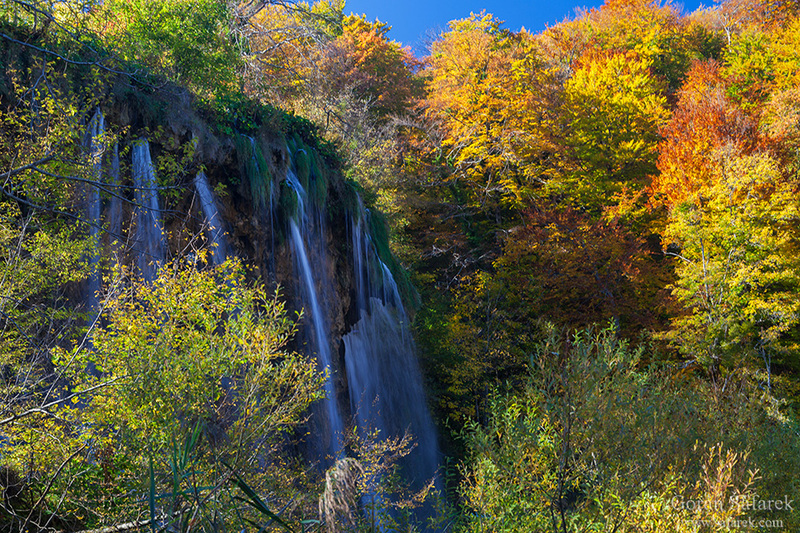 Plitvice Lakes National Park is undoubtedly one of the top Croatian landmarks. 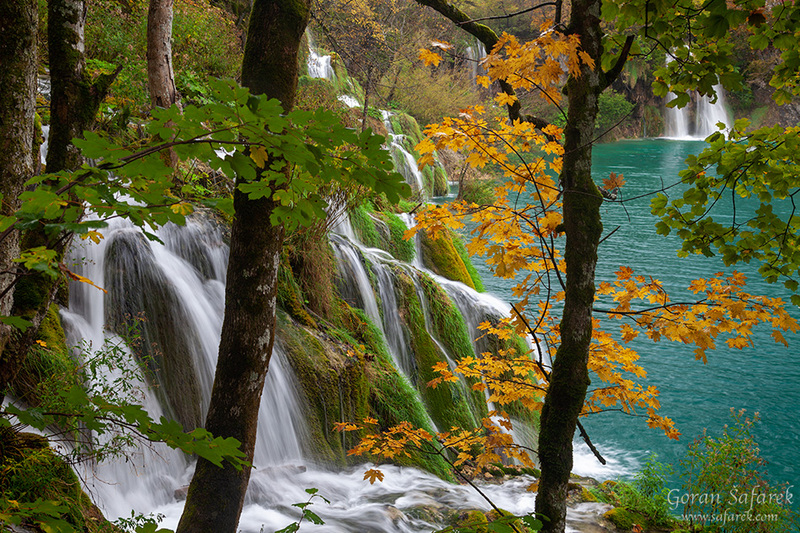 You mention Croatia and Dubrovnik with Plitvice Lakes spring to the mind. Extraordinary waterfalls tumble down to the flowing lakes, like nowhere else on the world. More than a million tourists come to the lakes yearly and urbanization has come to the gates of the lakes, but the hinterland is still wild enough for the bear, wolf and the lynx. The national park was established in 1949, while UNESCO inked it to its list in1979. 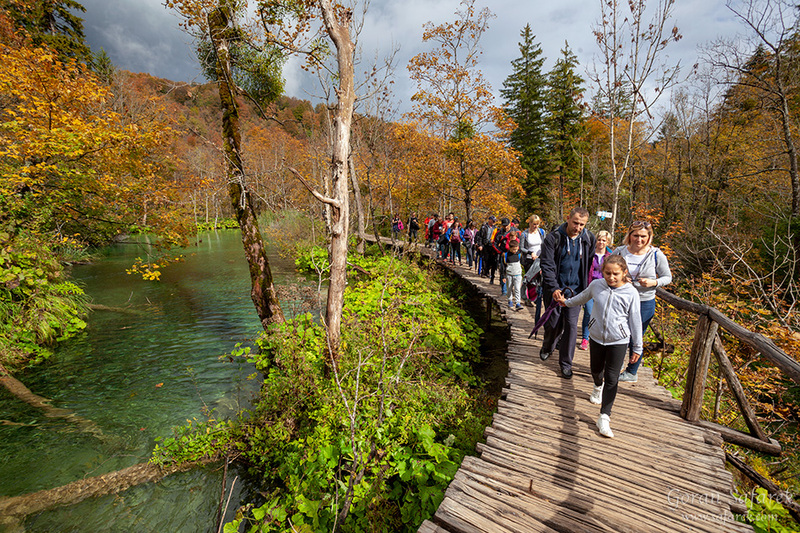 National park not only protects nature but also develops and manages the tourism, the only economic activity on Plitvice Lakes. Today, more than million people visit the lakes every year. Plitvice lakes (Plitvička jezera in Croatian) are divided into two distinct parts. The lower lakes, four of them, are in the deep canyon. 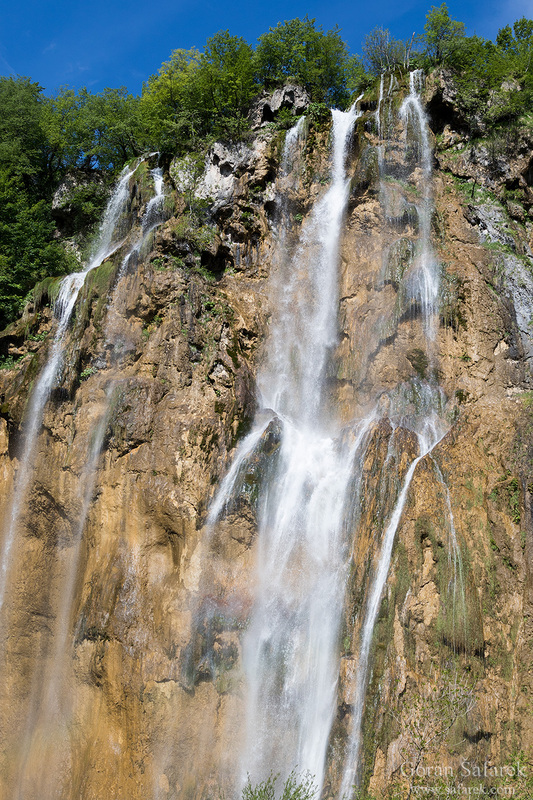 They end in a big waterfall called Sastavci, where the last lake tumbles down and meet the Big Plitvice Waterfall that comes from other direction. 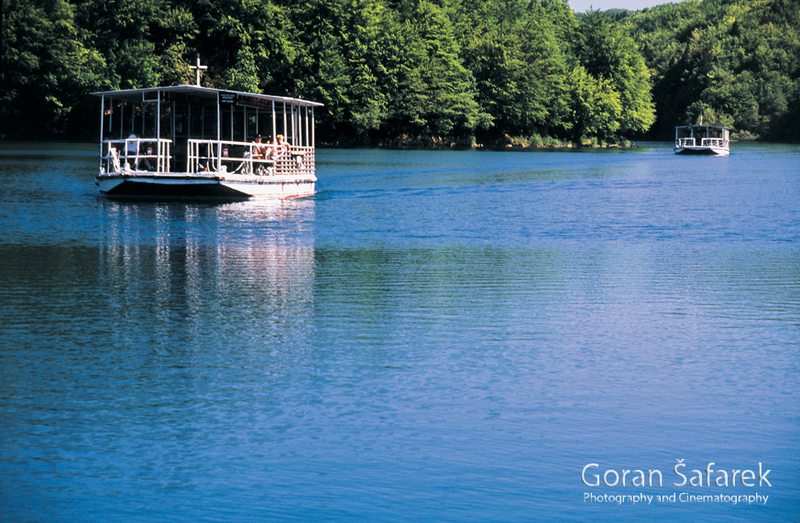 In this point, The Korana River is born, in maybe probably the most beautiful source in the world. This scene is easily seen from the viewpoints near the Entrance 1. The upper lakes are bigger and wider. The first lake, going upstream from Entrance1 and lower lakes is Kozjak Lake. This is the second largest lake, the biggest is Prošćansko Lake on the other side of the lakes, actually the first of all of them. In between are numerous smaller and several bigger likes. At places, the ground becomes a maze of barriers, waterfalls, ponds and smaller lakes. 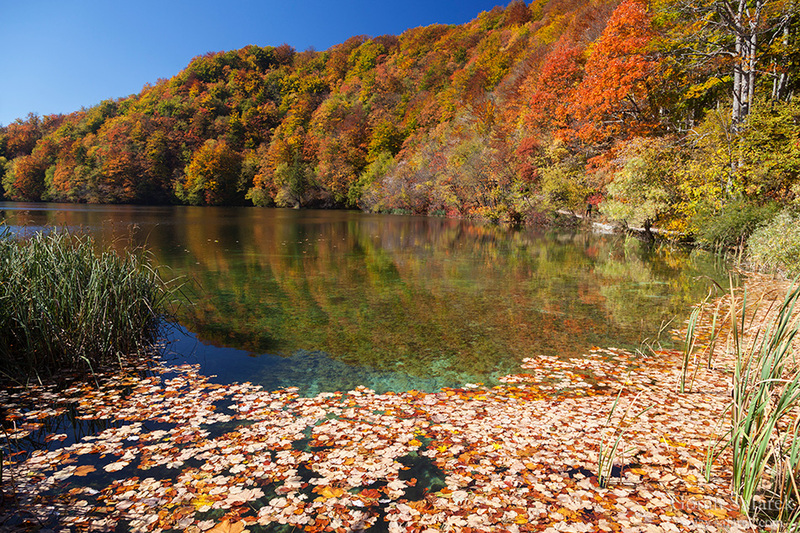 Unlike the Adriatic coast, Plitvice Lakes are popular all year round. Even in the winter, the gates are open and the park is attractive. Coupled with very cold winter, the lakes and the waterfalls are actually quite impressive (Read more). Spring brings lots of water and the waterfalls are in full throttle. Summer is the high season, although the lakes falls are less powerful. Autumn brings back some water, and in October the magical colors adorn the trees (Read more). If you are a solo visitor, then come as early as you can. Most of the organized groups come later in the day and clog the narrow paths. 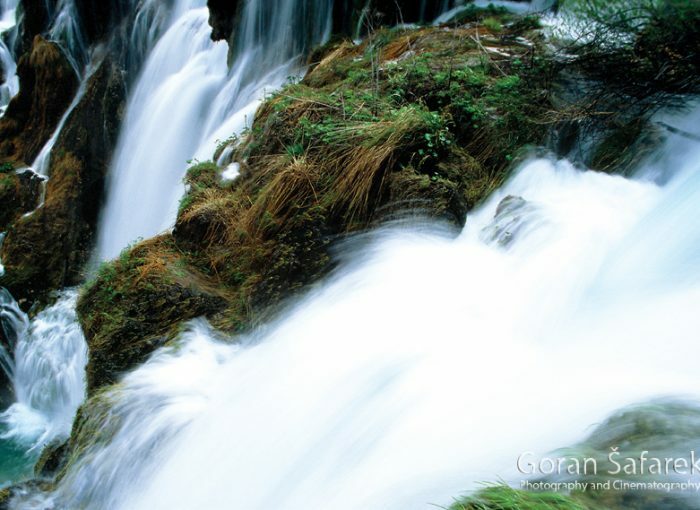 Plitvice Lakes are located in Lika region, close to the border with Bosnia and Herzegovina. The fastest way from getting there Zagreb is driving on the old road that connects Zagreb to Dalmatia. Pull off from Zagreb- Split highway in Karlovac, drive through the town and follow Split direction. Karlovac region is heavily populated so drive carefully – police could be lurking on the corner. If you are driving from Dalmatia, At Gračac junction (roundabout), follow Zagreb direction. From the highway, you can pull off in Otočac and Gospić and follow the road to Korenica and then turn to Plitvice Lakes. For those of you who do not have a car at your disposal, taking the bus is more or less the only alternative you have. There are two big public parking near the Entrances 1 and 2. They cost 70 kunas per day. For guest hotels, parking is included in the price of accommodation. During high season, par space is insufficient and many park on the edge of the road. Be very careful. Plitvice Lakes is definitely not a cheap park. In the high season (summer months), the entrance fee will cost you 250kn for adult and 110kn for children. There are many discounts though. If you come after 4 pm, the price is only 150kn for adults and 50 kn for children. Offseason in spring will also reduce the price to 150kn for adults and 70kn for children, and even more in winter: 55kn /30kn. You can also profit if you stay for two days. You will not only see more and spend less time running, but also pay less per day. It will cost you 400kn for adults and 200kn for children. The hard life of students is eased in Plitvice Lakes – they will burn less money in Plitvice: 160kn during high season (100kn after 4 pm), 100kn in spring and 45kn in winter. With the ticket, you can board also the train and boats – just keep the ticket with you all the time in case the park staff asks for it. Nothing beats a good sleep inside the national park, having a breakfast with the view to the lakes and the starting a day without parking trouble and crowds at the entrance. Three national park hotels will give you this privilege. Hotel Plitvice offers 51 accommodation units, including 19 superior rooms, 12 standard rooms, 20 economy rooms, and one suite. The economy rooms offer a queen-sized bed (160 x 200) and washroom with shower; the standard rooms offer two beds (one double bed 140 x 200, one single 100 x 200), and a washroom with bathtub; the Superior room offers a king-sized bed (180 x 200), washroom with bathtub, and pull out sofa, and balcony. All rooms are equipped with satellite television, direct dial telephone, and minibar. Hotel Plitvice has an a la carte restaurant with a capacity of 160 seats, lobby bar with outdoor terrace and TV saloon. The restaurant is suitable for the organization of business lunches, dinners or presentations, while the TV salon is a good venue for smaller groups and seminars of up to 40–50 participants, with all the necessary audio-visual equipment. Hotel Bellevue is situated in the direct vicinity of Hotel Plitvice, in the very heart of the lake zone in Plitvice Lakes National Park. The hotel operates as a “garni” hotel, offering only accommodation and breakfast services while boarding guests are served meals at Hotel Plitvice. As such, this hotel is particularly suited to accommodate organized groups of visitors. The hotel offers 74 rooms equipped with washroom with shower, direct line, and satellite TV. Within the hotel, there is a cafe, TV salon and summer terrace, and a bank. Hotel Jezero is situated in the central zone within Plitvice Lakes National Park, just 300 meters from Kozjak Lake. The hotel is a combination of excellent service and affordable cost, providing guests with a relaxing and comfortable vacation in a peaceful and friendly environment. Hotel Jezero has 210 rooms and 19 apartments, two of which are adapted for the disabled. The hotel includes a 400-seat restaurant, lobby bar and cafe, fitness hall, and the hotel complex includes a range of sports and recreation activities. The pleasant ambiance of the a la carte restaurant, made complete with a rich culinary offer and selection of Croatian wines, is the ideal place to hold business receptions, weddings, family and evening gatherings, so sometimes could be noisy. Hotel Grabovac is not in the park, but just 10 minutes away from Plitvice Lakes National Park, 15 minutes from the Baraćevi caves and 20 minutes from the Rastoke village and its mills. It’s surrounded by nature, enjoy peace and quiet. The tourism has become dominant industry kilometers around the Plitvice Lakes National Park. Korenica (direction to Dalmatia), some 20kmkm from the park, has become also a tourist hub for example. , some is also. Almost every house has become “Zimmer frei”, a private accommodation with a room or separate apartment. The closer you are to the park, the more exclusive is the accommodation, and recently there the area has seen some major investments. Many older houses are refurbished in a more traditional style of the architecture, with luxury at the same time. Book in advance if you can in regular booking services online, but even in you just happen to arrive, you will find something. Korana Camping – a campsite located just a few kilometers north of Plitvice Lakes National Park entrance, set on a plateau right above the Korana River Canyon. A large camping ground with a wide range of camping facilities, run by a local tourist company which can accommodate up to 2500 people. Camping Turist – established in 1968, run by a local tourist company, 8 km from the entrance of the Park and can accommodate up to 200 people in a wide range of camping facilities. Camping Borje – the site with very good camping facilities, 15km from the entrance to the Park, run by a local tourist company, can accommodate up to 350 people. Lovely location in the Valley of Lička Plješivica Mountain. The national park has developed several circles, each depending on the geography and the time. It could look confusing ath the beginning s study the maps a little bit. Gastronomy of the area is simple, sufficient and substantial: Lika style roasted lamb, veal under Peka (an iron bell used to cover meat, potatoes and vegetables, overlay them with hot ashes leave to simmer & bake slowly), sausages with sauerkraut, sheep & cow cheese, skewers and kebabs. Potatoes from Lika are a brand itself, fresh they are exported throughout the country, or roasted Lika style with butter they are a common delicacy. Inside the park, there are several options. The largest restaurant is “Lička Kuća” at park entrance No1. They offer traditional style meals. It is a large venue built to accept large groups, several coaches at once. It is a safe bet, decent offer, and good value. Restaurant “Poljana” is next to hotel Bellevue, close to Entrance No2. It consists of two parts: a canteen restaurant with twenty simple, tasty and affordable dishes; and a-la-carte restaurant with mostly local style barbecue dishes. Within the park, there is a restaurant “Kozjacka draga” at the boat pier. They offer fast food dishes, apple and berry strudel, sandwiches, and only from July to September barbecue meals. There are three simple diners’ at all three train stations, offering refreshments, ice-cream, and sandwiches. The surrounding region offers many possibilities. Just drive around and you will easily find them. With the ticket in the pocket, there are several ways to see the lakes – by foot, by train, and by electric boat. In fact, the best is to combine all three. If you are in good shape, you can hike everything – but be aware that hiking trails count in kilometers. The trails around the lakes are more or less flat, with a gentle altitude decrease from the Upper to Lower lakes. Still, it could be surprisingly exhausting. Additionally, there are other, true mountain trails around the park. The national park has developed several circles, each depending on the geography and the time. These circles are just descriptive and in reality, you can make your own circle combining all of them. You can start either on the upper lakes or on the lower lakes. The latter variant will be slightly easier, as you will mostly descend. You can make a full circle, not repeating the paths, or just slightly. Start on Entrance No1. From there, walk a short distance to the first viewpoint, with a great scene of the last lake, Big Plitvice Waterfall and Sastavci waterfall, also the source of the Korana River. From there, a path will lead you down the canyon, on a serpentine trail with several nice viewpoints along the way. Once on the canyon bottom, proceed to the wooden footbridge across the barrier and turn right to the Big Plitvice Waterfall. Before reaching it, at the corner, there is a good view on Sastavci waterfall, with the intimate look on the abyss below you! 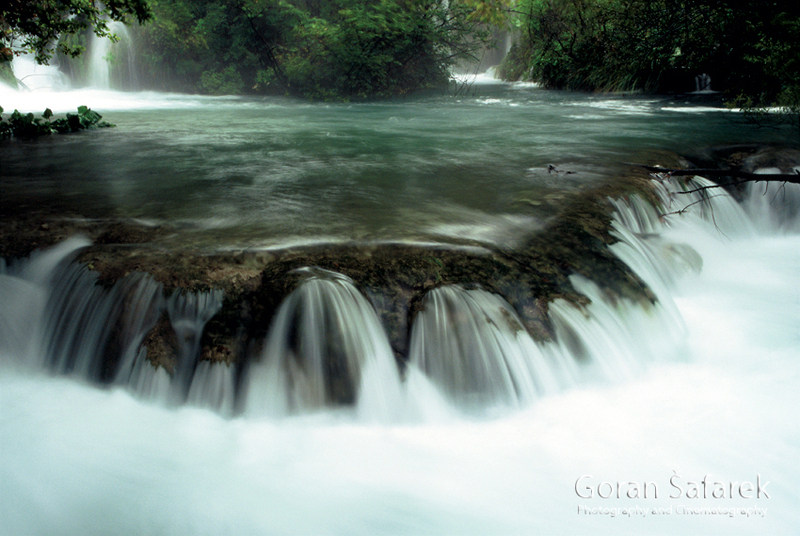 The spray will finally announce the Great Plitvice Waterfall you and you are face to face with a big one! After taking selfies and landscape photos of the falls itself, you can climb another trail, to reach the top of the waterfall. It is very steep so go slow. The path will get you to the other side, to a great viewpoint with a good view of the lower lakes. You can study them because of there where you will go further. Go back to the first junction and continue on the left bank of the lake (left, looking downstream) and enjoy the silence from the falls. You will quickly encounter another one and cross the barrier with smaller waterfalls. From this point, you can climb to the top of the canyon through a small cave with steep stairs (and go back to the Entrance 1 or train station on the opposite side), but you can proceed on the right bank on the canyon bottom. The main attraction here is Milka Trnina Waterfall, not high nor a big, but still nice where you can take a rest on the bench. Keep following the lakes and barriers until you finally come to the junction. This is the end of lower lakes. 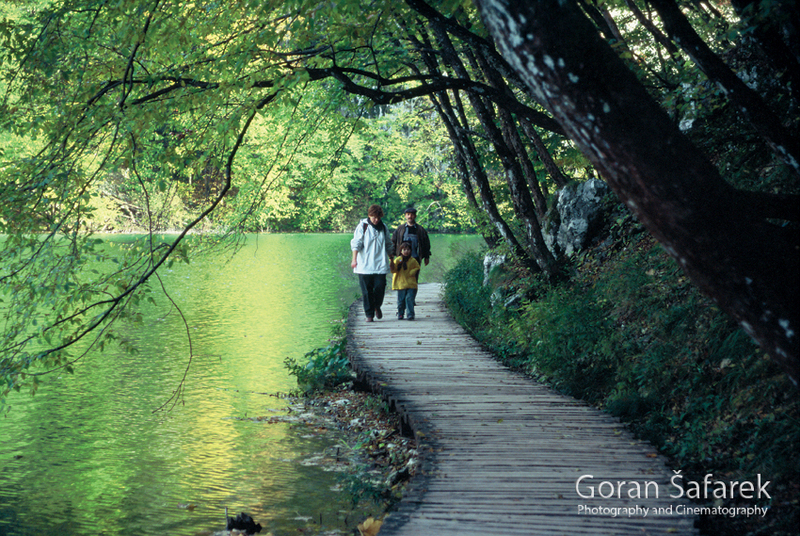 You can take a left path, a long trail around Kozjak Lake that goes to the central part. If you don’t want to walk (and you will have not much time, unless you are only running through the park), turn right at the junction and follow the footbridge and then partly on the road. You will come to a small meadow, boat pier (P1) with a fast food restaurant and tables to rest and eat. More important, get on the boat (ticket is included in the price). The electric white boat just like a swan is gliding with minimum noise and shake. 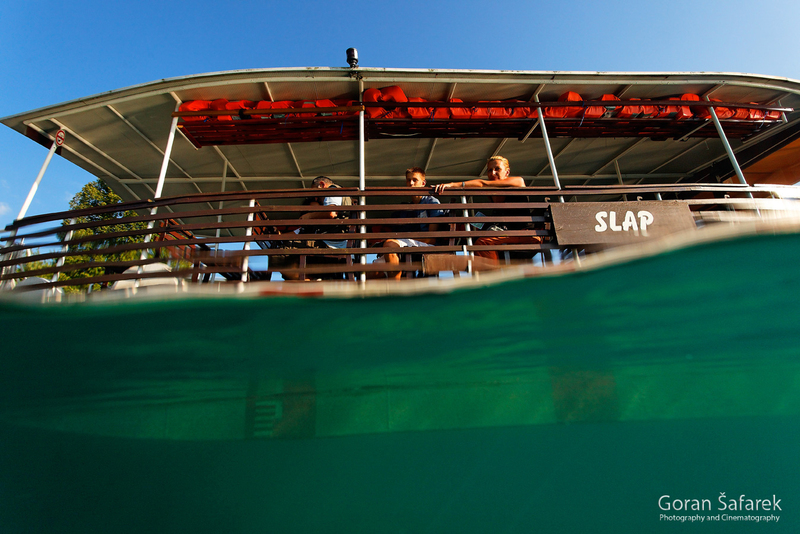 Enjoy the landscapes under the boat roof. You will soon get to another boat pier (P1), where you would end up if going by foot. From here, you can go the Entrance No2 – to the hotels, restaurants etc. or you get to other boat and continue the trip. This ride, however, takes just a minute, only to cross a narrow strait. After landing to pier P3, you will find yourself in the maze of small islands, narrow passages, and numerous bigger or smaller waterfalls. The main attractions are Great Prštavci and Small Prštavci. Thanks to the wooden footbridges, you are walking in the heart f the tufa landscape, where this porous rock is still growing. This is arguably the most beautiful part of the lakes. After that, you will reach Lake Galovac. There is a junction, and you can encircle it from both sides. The left fork is shorter and follows the left bank, while right goes across the waterfall and then follows the left bank of this lake. If you are still not tired or late, take this long way. It is less visited and offers some nice views. There are several benches and you can actually enjoy the silence. Then, there is a string of medium-sized lakes. You can then encircle them and head to the train station (St3) or, if you have time and energy, you can proceed towards the „Stubica“ elevation. A gazebo „Tomićevo pogledalo“ offers a magnificent view of Lake Ciginovac and the vastness of the Prošćansko Lake. Afterward, return to the last junction and finish your hike at the train station (St3). From there, relax on a ride. You can get out on the main station (St2) and Entrance 2. or continue with the train to the station on the lower lakes (St1). From there, you hike on the top of the canyon slowly downhill, with the great view on the lower lakes and finish your day back at the Entrance 1. You can freely take photographs, even professionals, so, you can use tripods. Remember, drones are not allowed in the park. The biggest problem in the park is the crowd. Sometimes, the best viewpoints are occupied and unintentional jostling is a constant companion. Then, on wooden footbridges, vibrations from the feet of visitors are felt from far away. It is not a problem for a snapshot, but the long exposure of the waterfalls will be ruined. For a serious photography, the only solution is early and late tours. The patience is needed more than ever! Light could be very tricky on Plitvice Lakes. The lower lakes are in a deep canyon, while upper lakes are more in the shade of the trees. Patchy sunspots and shades are death for even the best sensors. Take the most famous scene from Entrance 1 with a big waterfall. The sun position is such that you will never have an evenly lit scene. There will always be deep shadows, and only HDR might help you. For most of the photography the best time is overcast, or even a slight rain for extra saturation. On sunny days, early and late time will bring shadow and even light. The only downside is the need for longer exposures and tripods and the danger of vibrations and too many people in the scene. Drones are buzzing and zipping in the skies literally everywhere, but are not allowed and welcomed here. The fines are hefty. Camping is also not allowed. Don’t try to swim on the lakes or shower in the waterfalls. Water is cold anyway. You can see here How Plitvice Lakes look under the surface.